Lamb is a bit of a staple in our house. When I see a good deal at our local market I like to take advantage of it. This past Saturday I happened upon a couple of inexpensive lamb shoulder chops marked down by an extra dollar each. My plan was to do them “slow braised” and divide them in four for the family, but a surprise guest (a friend of my daughter) showed up for dinner and I had to extend them to feed five. I decided on going with a simple lamb curry. This killed to birds with one stone, as my daughter has been bugging me to make lamb curry since the last time I prepared it. 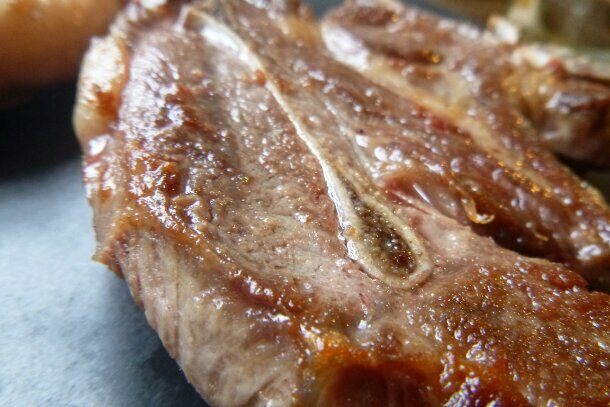 Lamb shoulder chops are highly underrated by most North Americans, who when they hear chops almost exclusively think of the tasty, tender and hellishly expensive loin chops. But shoulder chops are an incredible deal, delivering far more flavour at a fraction of the price. The trick with the shoulder chops (which admittedly are a tougher cut) is a long moist-heat cooking time. 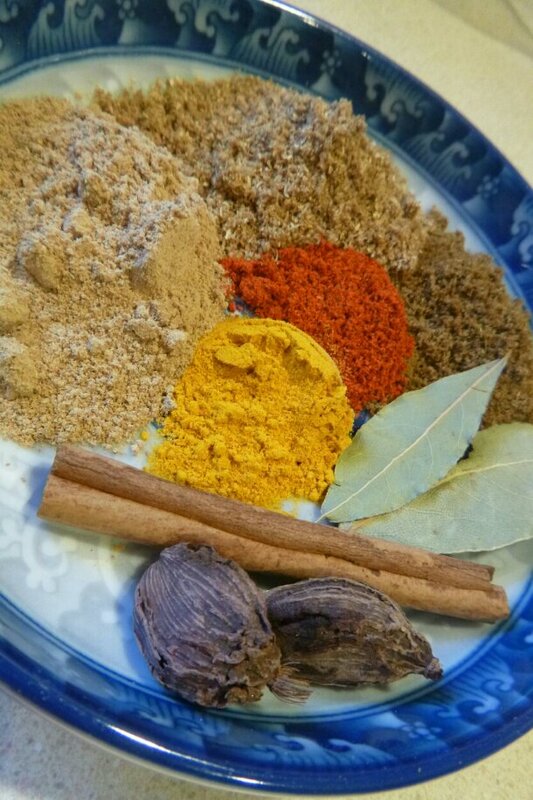 As a cooking method, curry is a natural for such cuts–drawing out the rich flavour inherent in the meat, fat and bones. Notes: Our dinner guest didn’t strike me as being very heat tolerant so I added very few chilies to the curry. My family members (except for my youngest) suggested that it could use more heat, and were it not for the guest I would have included at least the optional chili based ingredients indicated in the recipe above. Even with these additions it would qualify as a mild heat. As you can see the this curry is tomato based and tends to favour Northern Indian spices–but there are quite probably hundreds of “lamb curry” recipes from across South and Southeast Asia. Sometimes mana from heaven drops into your lap. The mana in this case was a lamb leg roast picked up at a good discount from one of the local supermarkets. The roast was fresh, about 2 lbs (.888 kg), and 30% off the usual horrendously over-inflated price. I was faced with the problem of pulling together a meal around this choice cut of meat that would satisfy all around the table. The kids are true carnivores, so no immediate problems with the main course, but the question was what to serve with the meat that would get eaten and give them the required dose of vegetables and/or fruit. I opted for a basic meat and potatoes affair with a side of fresh green beans (just coming into season… at least in California) and a fruit appetizer in the form of ripe papya and lime. The plan of attack was to get the roast in the oven and leave the balance of prep and cooking for the anticipated hour of cooking time for the meat. Unfortunately, the meat cooked much faster than expected–about 40 minutes–and I was left scrambling to get the rest of the meal prepared in time. The beans were a breeze, while time was short on the potatoes. The sauce was well under way before the meat was ready, but I was still forced to let the meat rest a little longer than anticipated in order to get the meal fully ready. Here’s a quick tip if you find yourself faced with the same situation. Take the meat out of the oven when ready (about five degrees Fahrenheit less than the desired finishing temperature), wrap it in tin foil, wrap it in a thick tea towel, and slip it into an insulated lunch kit or similar container. It will stay warm without further cooking for 15 to 20 minutes. Using the above trick and with a little luck, I was able to pull everything together. We ate about an hour and ten minutes after the meat hit the oven–not bad all things considered. Lightly oil enamelled casserole dish or stove-top safe roasting pan. Heat casserole on the stove top over medium-high heat. Sear roast on all sides (1 to 2 minutes a side). Place uncovered in oven and cook for approximately 20-25 minutes a pound (look for an internal temperature of about 130 degrees F). Remove from oven, wrap in tin foil and let rest for a minimum of 5 minutes. Notes: I like my lamb very rare, but others prefer it more on the medium rare side. When in doubt with guests go for the medium rare (remove from oven at 135F). 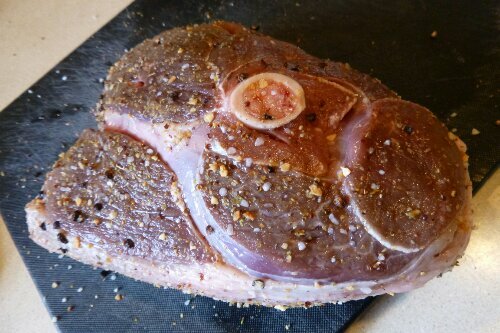 On larger cuts of lamb, pierce the meat and insert fine slivers of fresh garlic and/or whole peppercorn. Always cook dry lamb roast with a meat thermometer–it eliminates guess work and gives better results (even if you overcook it, you’ll learn where the tipping point is and hopefully get it right the next time).